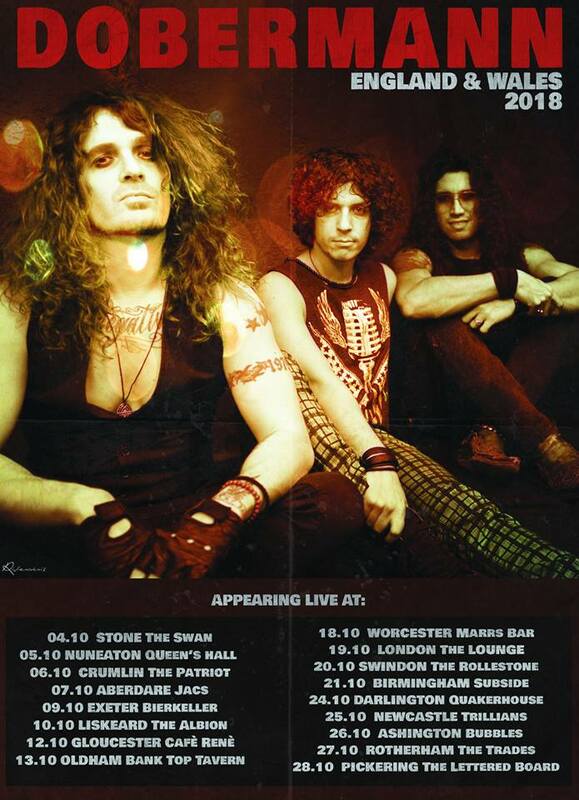 Home » News » Hard Rockers DOBERMANN Announce October UK Tour…. Hard rockers Dobermann are about to embark on their 11th UK tour! Set to kick off on October 4th, Dobermann’s trek will take in 20+ cities across the UK. Despite having no record label, no booking agency or management, the band fronted by singer, bass player and firebreather Paul Del Bello – and completed by guitar player Valerio ‘Mohicano’ Ricciardi and drummer Antonio Burzotta – have also kept up consistent studio activity, releasing 3 albums and an EP in a mere 7 years. Their latest album, Pure Breed, assembled by renowned Guano Apes producer Fabio Trentini, and featuring guitar legend Bumblefoot as special guest, has scored excellent reviews all around the globe, and assured them successful tours with Richie Ramone, The Quireboys, Inglorious, Great White, Rocket From The Crypt and Chris Holmes to name a few. Just like a solar eclipse....these guys are blinding!